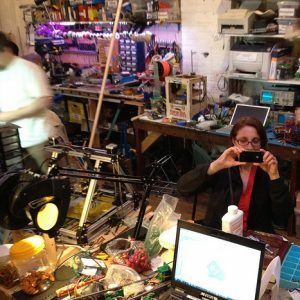 Maker and Hacker Spaces vary enormously, as do the facilities and equipment they have. Hacker spaces, as the name implies have an IT and/or IoT (Internet of Things) focus. Both may have equipment like 3-D printers, CNC machining, electrical equipment, darkrooms, woodworking or sewing equipment. You would need to visit (at least online), to find out if they have what you need. Here’s one for example, Decateurmakers, in the image to the right. Many maker and hacker spaces attract creatives and have appropriate materials and equipment. Maker and Hacker Spaces are often run by nonprofits and may be open to kids as much as to entrepreneurs. They frequently seek external finance, as well as charging memberships. This directory of maker and hacker spaces is incomplete—for sure. Please write to will@venturefounders.com to make additions, updates or improvements.